The Fike® FK-5-1-12 system is armed and ready to eliminate any fire hazard at a moment’s notice. Its 500 psi operating pressure provides ultimate design flexibility and ensures that the necessary amount of agent reaches every corner of the protected space in under ten seconds, extinguishing a fire in its very earliest stages. 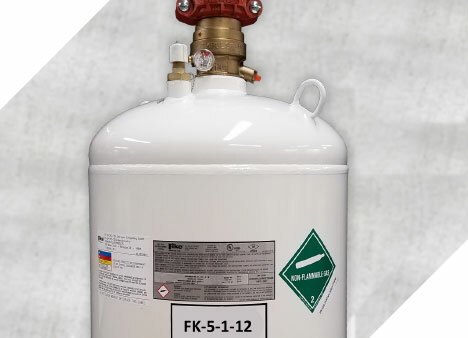 FK-5-1-12 extinguishing agent is ideal for protecting sensitive electronic equipment and irreplaceable items from fire and the damaging effects of fire sprinkler systems. It is electrically non-conductive, non-corrosive and leaves no residue behind after a system discharge. In addition to being safe for your local environment, FK-5-1-12 has a low impact on the global environment, with no ozone depleting potential and a global warming potential of one – the lowest of any chemical fire suppressant. Fike FK-5-1-12 systems may not be transported through, or installed in, any of the following countries: France, Germany, Italy, Japan, Mexico, South Korea, Spain, the UK, or the USA.